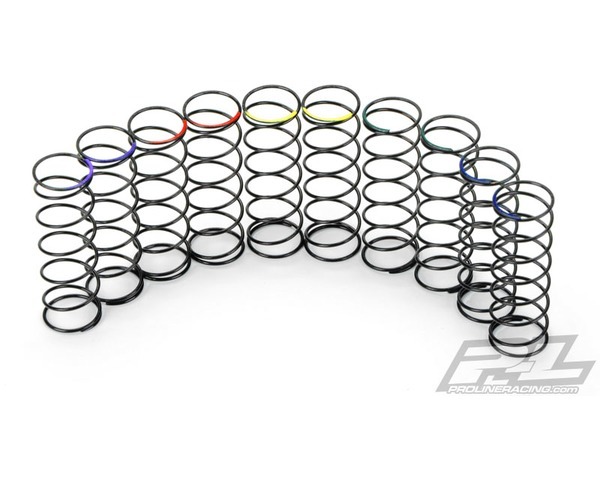 This is a Front Spring Pack for Pro-Spec SC Shocks. Do you need to dial in the Spring Rate on your Pro-Spec Shocks? This is the Spring Pack for you! This Spring Pack includes every spring that Pro-Line offers for the Front Pro-Spec Shocks in one pack. From Blue (Super Soft) to Green (Soft) to Stock Yellow (Medium) to Red (Hard) to Purple (Super Hard), this pack has them all. Get Dialed in with Pro-Lines new Spring Pack!